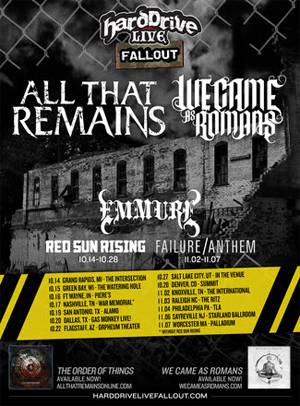 ALL THAT REMAINS and WE CAME AS ROMANS will co-headline the HardDrive Live Fallout Tour this fall. The tour kicks off on October 14th in Grand Rapids, MI and will run through November 7th (dates below with more shows to be announced soon). EMMURE will be direct support for the entire tour. RED SUN RISING will open from October 14th through October 16th and October 19th through October 28th. FAILURE ANTHEM will open from November 2nd through November 7th. Tickets will be available Friday August 28th at 10 AM local time at Harddrivelivefallout.com. 10.20 – Dallas, TX – Gas Monkey Live!